Summary: Headed to Limon to chase monsoon storms that were forming along the Palmer Divide. First storm intercept was north of Seibert where I tested out my Lightning Trigger type device under less stress than trying to use it during peak chase season. It captured a couple decent shots of lightning and I was relatively happy with the results. Other storms were forming East and Northeast of Pueblo and tracking ENE toward the Lamar and Kit Carson area. I headed south out of Seibert and when I arrived in Kit Carson I found a really great spot off of Hwy 287 and set up shop. I literally had a lightning barrage unfold before me for nearly 45 minutes. It was absolute bliss as my shots were coming out sharp and nearly perfect each time I closed the shutter. After heading east out of Kit Carson to Cheyenne Wells, more storms were firing Northeast of my location near Goodland, KS and there was a starlit sky above the action. I took a couple of shots although I wasn’t as happy with those, but the euphoria of knowing what I had already captured was more than enough to shrug it off. Here are the following results……….. 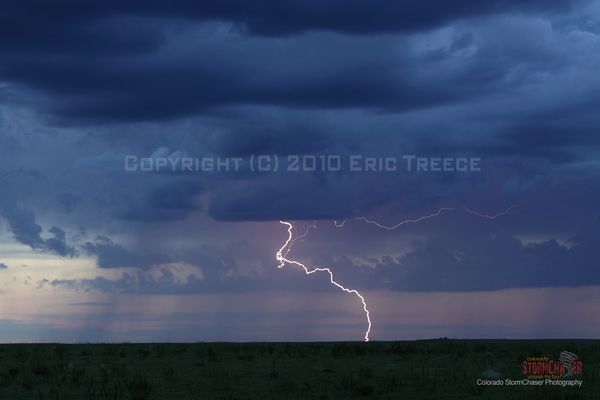 Lightning north of Seibert, CO.